I recently learned that Marvel’s superhero MMO Marvel Heroes will feature a playable Squirrel Girl (as well as Rocket Raccoon), voiced by Tara Strong. That means that Doreen Green and Twilight Sparkle have the same voice, and that’s awesome. 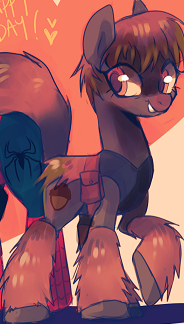 So, since I’ve got a Marvel title and a My Little Pony title this time around, I decided to share that tidbit, and dig up some ”Squirrel Girl as a pony” art to go with it. You might not have guessed it from my first review of this series, but this is one of the comic books I most look forward to in my shipments, because I am a sick person like that sometimes – and also because it is the spiritual successor (sort of) to Avengers Academy, which was the spiritual successor to Avengers: The Initiative, one of my all-time favorites. I’m disappointed in the lack of teen characters (outside of, barely, Reptil) from that series, but issue #7 took a break from the Murder World action to reveal Arcade’s reasons for this “game,” and kill off Initiative mainstay Constrictor to make up for that. Great issue, but not furry enough for a review. 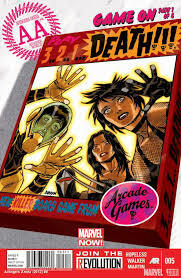 This issue is narrated by X-23, (fellow “contestant” Cammi calls her “Wolverita”), as she finally stumbles upon MIA-since-issue-#3 Juston, a favorite character of mine from Avengers Academy, despite never officially being part of that book’s team. I’m just glad he’s around a bit longer; as he himself mentions, it’s not like he’s the odds on favorite to “win,” here. Meanwhile, the rest of the contestants, a bit shaken by the first “player vs. player” death, decide that’s enough of that stuff, let’s try and work together, though Nara instantly forms her second love triangle of the series – and, in the issue’s obligatory “yeahbuhwhat?” moment, Apex switches genders. I liked artist Kev Walker on his Thunderbolts run; he is good with themes of heroism and villainy mixed – a weird thing to say, I know, but his pencils do have that feeling. Troll, from that book, who he was the first to draw the character, would fit in perfectly here. Though, there I go again; I love these characters, and there is a very real chance of them dying permanently, but that’s why I like it. There’s a sense of consequence here that is lacking in most superhero comic books. Seriously, this book is darker than Hack/Slash most of the time; it’s almost as dark as My Little Pony: Friendship is Magic #3. 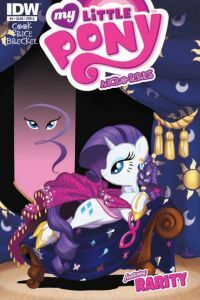 Rarity features in this Micro-Series issue by main series writer Katie Cook and artist Andy Price. In one hand, I thought MLP:FiM #3 was so awful, I used it as the punchline of the above review. On the other, their issue #2 is still hands down the best issue in the main series, so they can do this right. They’re more willing to take risks with the characters; that is their strength and weakness. Luckily, this issue is hilarious, though it may not be entirely appropriate in places. The story is entitled “How Rarity Got Her Groovy Back,” and features Rarity exhausted after a fashion show; her friends are worried that she’s working too hard, so Applejack suggests a trip to a day spa advertised in one of her farming magazines, which should have been everybody’s first clue this may not work out perfectly for Rarity. Turns out the spa is really a farm that is about to close; the hippy ponies Flax Seed (pretty much drawn and written as stoned the entire issue; it’s hilarious, but terribly inappropriate for a comic book nominally written for little kids) and Wheat Grass (I love Price’s character design here) are using the “farm labour is good for your inner beauty” ploy to advertise it as a spa. Rarity, however, sympathizes with them, especially since the farm is used for making beauty products. It’s up to her entrepreneurial skills to save the day! Both written and drawn gags are sharp, and the usual boatload of both show and pop cultural references are present. The only real drawback (besides the possible inappropriateness of certain gags) is the two page short by Cook to finish the book, featuring Hayseed Turnip Truck. It makes Spike look like a real jerk. This is a one-and-done kind of story, between the just finished “Krang Wars” arc and before the upcoming “Cityfall” arc. 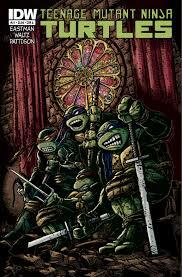 First of all, the art is by Kevin Eastman, so that’s worth the price of admission right there. This is old school Ninja Turtles. The story is also pretty good, though the twist is obvious; you should be able to see it coming a mile away. Heck, you’ll probably figure it out from this review, though I’ll not spoil it on purpose. Anyway, the Turtles are on patrol when they are accosted by a strange creature in a weird mask who taunts them, uses multiple fighting styles on them and hints darkly that he knows where they live. The Turtles chase him throughout the city, trying to stop him from getting back to the church where Splinter is unaware of what’s going on. After the twist, there’s one final short story arc, where Shredder and the Foot uncover something in Japan that comes directly from the recent The Secret History of the Foot Clan miniseries. I won’t spoil this reveal either, but I will say that fans of three-tailed … pterodactyls should be excited. And then I will apologize to Russian furries; sorry, Russian furries.